dark patches or empty spaces in the centre of your vision. You might also need extra light, be sensitive to glare, notice you can't see well at night, and be less able to distinguish between colours or contrasting objects. If you have any of these symptoms, don't dismiss them as simply part of getting older. There's a test you can try yourself to see if you have macular degeneration – it's called the Amsler grid. This shows whether you're seeing straight lines as wavy or bent. It can also pick up if you are seeing dark spaces or empty patches. You'll find the test on this page – click the button at the top of the page that says "Take the test". If you have any sudden changes in vision, make sure you see an eye specialist (ophthalmologist), optometrist or GP as soon as possible – within a week at the latest. The earlier you get treatment, the more likely it is that your vision can be saved. If you delay treatment you're more likely to lose your sight. Try this search if you want to find an optometrist. Or you may want to see an ophthalmologist (eye doctor and surgeon). There are charges for both these services. As well as the Amsler grid mentioned above, there are other tests your eye specialist can do for macular degeneration. Eye examination: Your optometrist or eye specialist might dilate (expand) your pupils with eye drops so they can get a better view of the retina at the back of your eye. Your vision might be blurry for a few hours after these drops and you shouldn't drive until you can see clearly again. Optical coherence tomography (OCT): This is a scan of the back of your eye. It allows your optometrist or eye specialist to see what's happening in each layer of your retina. Fluorescein angiogram: In this test, photos are taken of the back of your eye after a dye called fluorescein is injected into a vein in your arm. The dye travels to your eye where it highlights any abnormalities or damage to the blood vessels at the back of your eye. 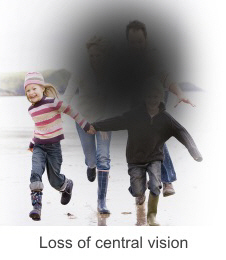 Your optometrist or eye specialist will use this test to investigate wet macular degeneration.